On Nov. 4, Americans will head to the ballot boxes to help lay a path for the nation's future. For South Dakota farmers and ranchers, the 2014 DakotaFest in Mitchell, S.D., on Aug. 19-21, offered the opportunity to listen to debates and get to know the candidates for the U.S. House of Representatives, U.S. Senate and South Dakota Governor seats. The discussions ranged from the Afforable Care Act, to Medicaid to the Farm Bill. Here is a round-up of agricultural highlights. Possibly the most heated of the three debates at DakotaFest, Noem and Robinson sparred over everything from environmental regulations to the Keystone pipeline project. Noem argued that while there is a place for the Environmental Protection Agency, the current administration is very aggressively trying to push forward new regulations that would inhibit farmers and ranchers from going about the business of producing food. She credits agriculturalists for being stewards of the land and protecting it for future generations, without intervention from the EPA. "The EPA is one of the greatest threats to our way of life," said Noem. "These regulations are coming from desks 1,000 miles away. We have had a very aggressive EPA in this administration." She cited examples of the EPA's failed attempt to regulate dust on farms and ranches a few years ago, as well as the current efforts by the EPA to regulate navigable waters, which could include everything from a seasonal pothole, to a stock dam, to water in the ditches. Robinson countered that the EPA is not to fear – instead a middle ground must be found between farmers and ranchers and the governing agency. "Yes, the big EPA – governing our country with stricter standards that we fear the most – but to some extent, these regulations are necessary," Robinson said. "It's going to take some education and meeting the EPA halfway. I hope that South Dakota can be the leader in this regard and understand the effects on the land, air and water." On the topic of the Keystone pipeline project, which will transport Canadian crude oil to Gulf-state refineries, Robinson and Noem were at polar ends of the discussion. 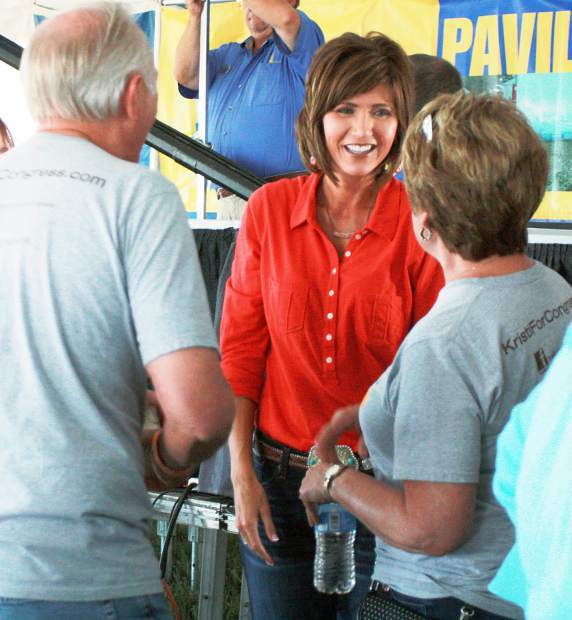 Noem received an enthusiastic applause from the crowd when she announced she will continue to support the project as it will bring 42,000 jobs to the area, as well as a projected $9 million in income to South Dakota. She criticized President Obama's administration for delaying the Keystone project and said she preferred to spend money on oil from Canada verses supporting Islamic terrorist in the Middle East. "In Iraq, we have a terrorist group who would love nothing more than to put their flag on our White House. Why would we support that? I think if there were ever a time to build a Keystone pipeline it's right now," Noem said. Robinson argued that the pipeline would only bring temporary jobs to the state but would leave permanent damage on the landscape of the South Dakota prairie. "I oppose the Keystone Pipeline. It's not in our best interest in the long-term. We can do better. We really can. We can promote more solar and wind energy. It's not going to be easy. It's going to take a lot of time and money. We don't need to risk leaks that would definitely destroy our farming and our Indian reservations." Noem and Robinson had different views on the Farm Bill, as well. Robinson focused on cuts to the food stamp programs, while Noem said she was most disappointed in the lack of farm policy that protects livestock owners. "I thought the response to the Atlas blizzard was unacceptable," Noem said. "When we have hurricanes, whether it's in the U.S. or the Philippines, FEMA is quick to respond. When ranchers were hit by the Atlas blizzard last October, it took months for South Dakotans to receive any help. I've had to explain to other members in Congress that every district in the nation eats, and strong farm policy is good for everyone." Meanwhile, Robinson criticized the Ag Committee for allowing the Farm Bill to expire. "Why did the Farm Bill have to expire?" she asked. "What is disturbing is that we have a pretty significant agricultural committee, and they let the Farm Bill expire. Then once it was formed, they stripped $41 billion from food programs. The Farm Bill isn't just for farmers, it's for urban communities, as well. We must think about others who are less fortunate." Noem said she is proud of the Livestock Disaster Programs she helped implement on the new Farm Bill. "I worked on this Farm Bill quite extensively, and there are a lot of good things in it," Noem said. "We reduced $23 billion out of the Farm Bill. For years, farmers have been criticized about getting direct payments from the government; those have been eliminated, but we made sure to protect crop insurance. I'm proud of the livestock disaster programs we have in place. We rectified a flaw in the previous farm bill where the livestock direct payments weren't funded. We retroactively went back and covered the drought of 2012. So many people didn't get help during that, and they were able to get that done. We also had some great wins for the pine beetle fight in the Black Hills, which is a million-acre fight in that area. Through the Farm Bill, we can now protect that treasure in western South Dakota. The Sun Grant will be critical in developing new technologies in renewable energy, as well. That research is being done through SDSU. We have great energy policy in the Farm Bill, as well." The gubernatorial debate wasn't as charged with polarizing issues, and the discussion centered around the EB-5 program, economic development in the state, teacher salaries and reducing the state's debt. However, the candidates did address one question from the crowd that directly related to farmers and ranchers – "How do you plan to export our agricultural products when our roads are falling apart?" "Roads are certainly important for transporting goods," said Daugaard. "Right now, our roads–- the interstates and highways – are the best they have ever been because of stimulus money we have received. On the county and city levels, roads are in poor shape and cannot accommodate the weight of the farm equipment that are on the roads today. At the county level, we rely on license plate fees, property taxes and wheel taxes. However, most observers believe that the revenue streams that we have today are not adequate to maintain or improve the road situation we have today." Wismer admitted that while the stimulus dollars helped fix infrastructure issues on interstates and highways, she said the state is dropping the ball in fixing local road issues. "The state is refusing to give locals the tools they need to address the road issues," Wismer said. "Some cities haven't been able to implement a wheel tax. We have known what the problem is for a long time, but nobody is willing to address solutions. This administration stands in the way of cities solving their own problems. If I was governor, I would change that." Myers cited an underlying issue that could be behind the road problems – water. "Water is what is breaking down the infrastructure," he said. "Water from our fields is being pushed from county to county, and water does not recognize political boundaries." Sparks flew during the Senate debate, with challengers Weiland, Pressler and Howie criticizing former governor Mike Rounds on his past record during the hour-long debate at DakotaFest. When asked about top priorities if voted in as South Dakota's senator, Howie said he would "repeal Obama Care and replace anyone who supported it." Meanwhile, Pressler said being an Independent would allow him to work with both sides of the aisle. And Weiland said he would try to eliminate the "Big Money" in politics and restore honesty in Washington, D.C.
Rounds appealed to the largely agricultural crowd, citing his priority as a U.S. Senator would be to stop the EPA. "My first priority would be to get control of and shut down the operations of the EPA," said Rounds. "The EPA is out of control. They want to be able to regulate ditches and farm ponds, and be able to call them waters of the U.S. They have done more damage than any other bureaucracy in the U.S. In order to do that, we will need to fire Harry Reid as the majority leader in the Senate. I think big government is our biggest challenge, and we want big government out of South Dakota. This is about whether or not you want Washington, D.C. out of your backyards."